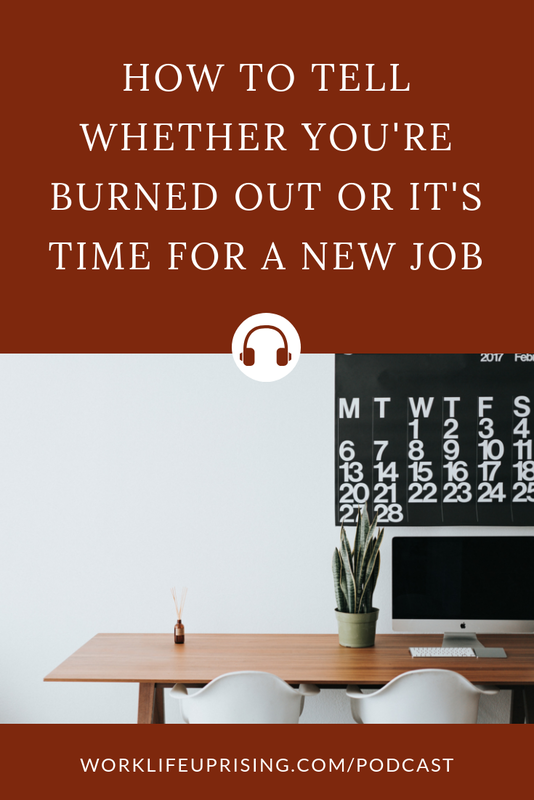 Today's question: Are you burned out or do you need a new job? Today I want to talk to you about how to tell the difference between whether you’re burned out or you need to look for a new job. Because sometimes it can be hard to tell the difference. When Sunday afternoon rolls around and you get that telltale pit in your stomach and it’s become a regular thing, you know somethings not right. But what? It can be easy to get frustrated with your job and assume that its time to polish up your resume and start looking for something new. But that’s not always the case. In fact, more often than not, it’s usually just that your overworked, overwhelmed and headed for burnout (if you’re not already there). So, I thought I’d run through a few signs and signals you can look for. Here are four questions to ask yourself that will help make things clearer. Picture this, you’ve just taken a lovely 4-day weekend, so you can really relax and unwind. You finally had the time you needed to dig into that book that’s been sitting on your nightstand for months. You got to sleep in and luxuriate in bed and had a wonderful time chatting and catching up with your girlfriends at brunch on Sunday. If you feel better once you’ve had some time away to recharge, you’re probably overworked. Even if you only get the teensiest bit of relief. On the other hand, if you come back from your lovely long weekend and don’t feel any different at all it likely means you do need to start searching for a new job that’s right for you. Have you been feeling irritated, impatient and annoyed by lots of little things? And I’m talking about things that wouldn’t typically bother you that much. Or have you been so overwhelemed with the massive stacks of work you need to get through that you really haven’t been in the mood (much less had the time) for watercooler chat with your coworkers? If this is the case, you’re likely experiencing case of the I’ve-got-too-much-on-my-plate-itis, and its time to figure out a way to cut back and give yourself a break. But if your frustration comes from your manager not recognizing you for the good work you do and the contributions you make to the company. If you’re not feeling supported by your boss, or your values don’t align with the mission and values of the company, that’s a different story. And it’s likely time to update your resume and start hunting for a job, and a company, that’s a better fit. Did you used to feel super passionate about your work but now its feeling pretty lackluster? Going to work used to truly energize you but now it’s feeling like a daily chore. And maybe figuring out how to change things feels almost impossible. Chances are, you’re burned out. But if the reason you’re feeling less enthusiastic about your job isn’t that you don’t enjoy your work but is that your team or your boss get in the way of your vision? If you regularly daydream about having a super supportive, amazing boss at a company that thinks you’re amazing at what you do? That’s a totally different story and its time to start thinking about moving on. Not to mention that if you’re feeling like you can’t be yourself at work and be honest about your thoughts and opinions, it’s definitely time to get the heck out of there! You’re a busy person with a demanding job. You’re constantly responding to work emails 24/7 because its important to you to be responsive to your clients and co-workers and managers and you don’t have time for silly stuff like rest and taking time off. Nothing will get done if you’re not there to keep everything moving along smoothly. I hate to break it to you but if these are the thoughts that are running through your head on a regular basis? You’re definitely overworked and on the fast track to burnout. Now, it’s a totally different thing if you’re doing your best to get your work done but it’s not overly demanding. If you’ve gotten to the point where you dread going to the office because you know that each day will drag on and on and on, that’s probably a sign you’re not being challenged, and your skills aren’t being put to good use. Definitely a sign that its time to move on. If you have a daily case of the Mondays, and haven’t quite figured out why, take some time to think through these questions.